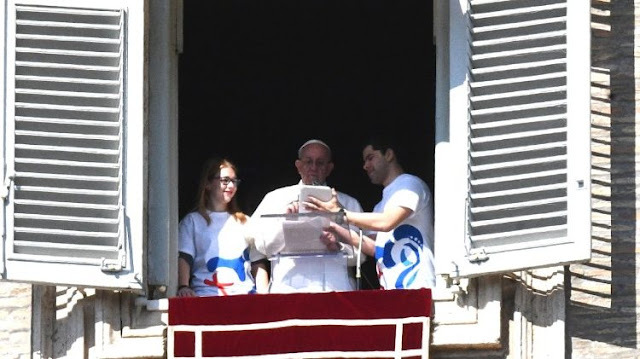 Pope Francis opens World Youth Day online registration by registering himself using a tablet before a crowd in St Peter’s Square. Then with the help of two people on either side, Pope Francis registered himself. “There.” He said, “I am now enrolled as a pilgrim to World Youth Day. I invite all young people around the world to live this event of grace and fraternity with faith and enthusiasm, either by going to Panama or by participating in their communities,” the Pope concluded. World Youth Day will take place in Panama from 22-27 January 2019. Pilgrims can now register online here, just like the Pope did! Pope Francis then sent cordial greetings to the “millions of men and women who will celebrate the Lunar New Year” on 15 February. He hopes that they “will live ever more in solidarity, fraternity, desiring to do good, to help create a society in which every person is welcomed, protected, promoted and integrated.” And he invited them to pray for peace. The Pope then greeted families, parishes, and groups from Italy, Spain, and Portugal. He greeted in a particular way the Congolese community from Rome present in the Square. “I join in its prayer for peace in the Democratic Republic of the Congo,” he said, and reminded everyone that “this intention will be particularly present on the Day of Prayer and Fasting that I have called for February 23rd.